Contact us for any to your storage needs. Apexx Enterprises provide Engineering Services and provide electrical and mechanical fabrication services for low rate prototype efforts and we manufacture a wide range of products including Fiberglass Reinforced Plastic (FRP) tanks to meet virtually any fluid storage requirement. Our Fiberglass Reinforced Plastic (FRP) tanks are lightweight, corrosion resistant and essentially maintenance free. Engineering & Design: Apexx offers full in-house drafting for custom fabrications. Our skilled engineers utilize 3-d Computer Aided Design (CAD) software to deliver accurate fiberglass products to meet our clients’ individual specifications. Our Fiberglass Reinforced Plastic (FRP) tanks come in a wide assortment of sizes configurations, and styles to meet virtually any storage and processing need. We can provide hand lay-up (contact molded) and chop/hoop and helical-wound (filament wound) construction. Vertical and horizontal with flat, cone, dished or sloped bottom. Capacities range up to 40,000 gallons with diameters ranging from 4 ft to 12 ft, and lengths up to 50+ ft. These tanks are highly resistant to a variety of chemicals, corrosive environments and utilize UV inhibitors in the gel coat to block the damage caused by ultraviolet light. 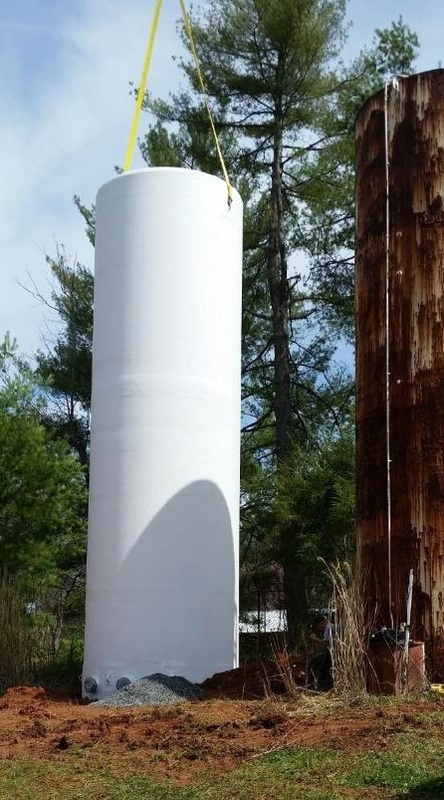 Fiberglass Reinforced Plastic (FRP) Tanks are advantages over metal tanks when the limits for chemical resistance, excessive maintenance, or economic reasons. They are lightweight, corrosion-resistant, and above all, maintenance free. When insulated they provide excellent thermal insulation with low heat loss. Resistant to galvanic and stray electrical currents, a feature not available in many other materials. Flanged nozzles with plate or conical gussets are available. Fiberglass Reinforced Plastic (FRP) skirt, Fiberglass legs, or steel legs support can be constructed for tanks with special support requirements. Lifting lugs and hold-down lugs are available to fit certain requirements. Baffles of all size are available.